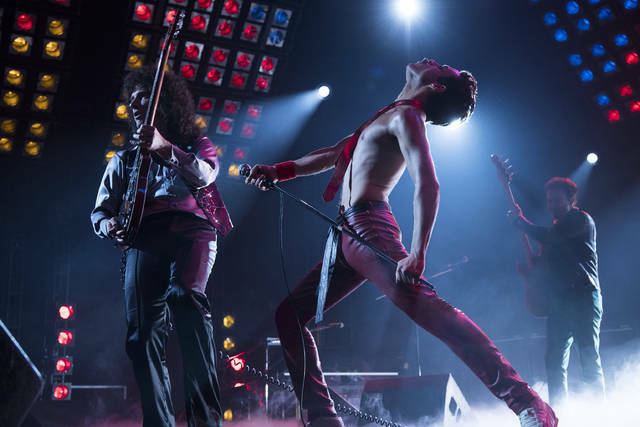 NEW YORK (AP) — The Freddie Mercury biopic “Bohemian Rhapsody” and 20th Century Fox are — for now, at least — champions of the world. But audiences rushed to theaters to see the widely praised performance by Malek, the “Mr. Robot” star, and to hear Queen’s foot-stomping anthems like “We are the Champions,” ”Another One Bites the Dust” and the operatic title song. The movie, which Bryan Singer directed before being replaced by Dexter Fletcher, at times has an almost concert-like feel, including a lengthy re-creation of the band’s 1985 Live Aid performance. Though Disney’s record of success is the envy of Hollywood, “The Nutcracker and the Four Realms” marks the studio’s third misfire this year following the underperforming “A Wrinkle in Time” and “Solo.” The studio’s CGI-stuffed resurrection of E.T.A. Hoffmann story was positioned as an early holiday season release, but flopped with critics (34 percent “fresh” on Rotten Tomatoes) and sparked only modest interest from audiences. It grossed $38.5 million overseas. “Bohemian Rhapsody,” made for $52 million, was largely dismissed by critics as an overly conventional rock biopic (60 percent “fresh” on Rotten Tomatoes). But the film proved more popular with moviegoers, who gave the PG-13 release, produced by Graham King, an A CinemaScore and 4 1/2 stars out of five on Comscore’s PostTrak audience survey. Paul Dergarabedian, senior media analyst for Comscore, praised Fox’s rollout of the film as “pitch perfect.” Dergarabedian also cited Malek’s breakout big-screen performance and the sustained interest in all things musical at the box office. Musically based films have lately been major draws in theaters, from Fox’s own “The Greatest Showman” earlier in the year to Warner Bros.’ Oscar favorite “A Star Is Born,” which collected another $11.1 million in its fifth weekend for $165.6 million overall. In limited release, Joel Edgerton’s acclaimed gay conversion therapy drama “Boy Erased,” starring Lucas Hedges, opened with a strong per-theater average of $44,000 in five theaters. Matthew Heineman’s “A Private War,” starring Rosamund Pike as war correspondent Marie Colvin, opened in four theaters with a per-theater average of $18,000.